SAN DIEGO, Sept. 9, 2016 – Sony Electronics, a worldwide leader in digital imaging, has today introduced their first POV cameras to feature the innovative Balanced Optical SteadyShot (B.O.SS) image stabilization technology, the FDR-X3000R 4K1 model and HDR-AS300R Full HD model. The flagship feature of the two new cameras – Balanced Optical SteadyShot2 – is an advanced form of image stabilization where internally, the camera’s lens and sensor are joined and moved together to compensate for camera shake caused by excessive motion, whether shooting handheld with optional accessories or during a fast-paced sporting activity. This is a particularly effective technology when paired with a POV action camera design as it ensures captured video footage is smooth and stable – even in 4K or high-frame-rate shooting modes. The versatile new FDR-X3000R and HDR-AS300R Action Cam feature a new ZEISS® Tessar lens with significantly less lens distortion than previous models3. They are also equipped with a new back-illuminated Exmor R® CMOS sensor with large pixels designed for 16:9 aspect ratio video plus a powerful BIONZ X™ processor, ensuring that video quality remains consistently strong across all settings. The new cameras utilize full pixel readout without pixel binning technology to produce exceptionally high resolution and accurate colors in both 4K (FDR-X3000R only) and Full HD videos. This allows them to read and process data from all of the sensor’s pixels, producing highly detailed video content with minimal noise and ‘jaggies’ in a variety of formats including the high data stream XAVC S™ codec (100Mbps in 4K and 50Mbps in Full HD) 4. The FDR-X3000R can also shoot 120p in Full HD and HDR-AS300R can shoot 120p in HD for impressive slow-motion footage 5. Both cameras offer a new angle of view adjustment, with a 3x smooth zoom or preset “wide”, “medium” and “narrow”6 settings. This allows shooters to get even closer to the action during movie recording, and reducing barrel distortion common with wide view POV cameras. FDR-X3000R and HDR-AS300R each have a built-in stereo mic7 with wind noise reduction to reduce the impact of wind interference on overall audio quality, and are equipped with stereo microphone input for advanced recording. Sony’s new Action Cam models will be offered in a kit with a compact Live-View Remote8 that is about 30% smaller than previous9 version. The remote, with a mountable design, acts as an extension of the camera and allows users to see what is being recorded when the camera is not accessible. The remote has the ability to control various functionalities including shooting settings, start/stop recording, power on/off and more. It also features an “auto display off” mode that turns off its LCD screen display automatically during shooting in order to save power of both camera and remote. The versatile remote accessory can be attached to various optional accessories such as Finger Grip (AKA-FGP1), Shooting Grip (VCT-STG1) or Handlebar Mount (VCT-HM2) using supplied mount adaptor, or worn as a wristband using supplied belt. Users can also utilize Sony’s PlayMemories Mobile™ application – available for both Android and iOS – to control the new Action Cam with a smart device10. Based on extensive feedback from athletes, filmmakers and more casual users, the new cameras and Live-View Remote feature a more in-depth user interface and menu system, with a rich indication of camera settings that makes it easier to navigate menus and customize settings as needed. The new models also offers “Wi-Fi high power mode”, which extends to communication distance between the camera and Live-View Remote11 for more flexible shooting. The FDR-X3000R and HDR-AS300R both include a unique Time-lapse Capture feature that shoots still images in pre-set intervals that can later be transformed into a stunning 4K time-lapse movie utilizing the Action Cam Movie Creator software12. The Action Cam App13 can also create time-lapse movies in Full HD. Built-in GPS inherited from previous models3 is available, allowing location tracking and speedometer to be added to the video file when Action Cam Movie Creator is used. This also allows GPS Data Overlay on video to read your speed data and generate another video file14 that includes your route, speed information, etc. Additionally, an updated version Sony’s own in-built movie creator – Highlight Movie Maker15 – is available in the new cameras. The innovative feature, which now utilizes face detection technology, automatically assembles footage into a video highlight package and pairs it with custom music for the ultimate viewing experience. For the more advanced user, there are an expanded scope of manual controls and setting adjustments including white balance, and auto exposure shifting. Loop recording is also available, allowing users to maximize usage of available memory card space to ensure they get the exact shot they are looking for. The FDR-X3000R and HDR-AS300R have a splash-proof body and are waterproof with supplied Underwater Housing (MPK-UWH1) 7 that is certified down to 197 ft. / 60m in depth. A new range of accessories for Action Cam has also been announced, including the Finger Grip (AKA-FGP1) that is an ideal travel accessory as it enables flexible one-handed shooting and the MC Protector (AKA-MCP1) for extra protection from lens scratches and dirt. The new Sony FDR-X3000 will be sold as body only for about $400 US ($550 CA), and will be offered as a kit (model FDR-X3000R) with the new Live-View Remote for about $550 US ($700 CA). The new Sony HDR-AS300 will be sold as a body only for about $300 US ($400 CA) and will be offered as a kit (model HDR-AS300R) with the new Live-View Remote for about $450 US ($550 CA). The new AKA-FGP1 finger grip will be sold for about $25 US ($40 CA), and the AKA-MCP1 lens shield will be sold for about $35 US ($50 CA). All products will be available in North America in late September at authorized dealers. 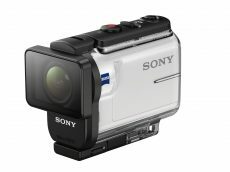 For more information on the new Action Cam lineup, please visit the Action Cam homepage within sony.com. This entry was posted in Press releases and tagged FDR-X3000R, HDR-AS300R. Bookmark the permalink. Trackbacks are closed, but you can post a comment.